Oh God, here he comes now. Okay, he actually greeted me. Now I need to say something… anything. Run down my internal checklist—Step One: wipe drool from mouth; I wiped my mouth; check. Step Two: open mouth and speak; say something… come on, anything… nope, I got nothing. Step Three: refer to Step One and repeat. Sigh. This gorgeous man now thinks I’m a moron. Of course, I know that my secret—okay, not so secret—crush, Reese Willoughby, could never have any interest in me anyway. There’s just no way that he hasn’t noticed me openly ogling him at work. I know everyone else in the office has surely seen it. When Reese finally asks for my help with a work project, I can’t help but feel over the moon. Now I can only hope that he notices just how much I like him, because there is no way I’m about to make the first move. I just loved everything about this book. It gave me the feels! There is mention of child abuse, so if that is a trigger for you, you may want to use caution or just pass up. Caleb had a crappy childhood until the age of 14, when he was adopted by his best friend’s parents. Reese is the hottie at Caleb’s work. When these two get together it is flipping awesome, you can’t help but cheer them on. I don’t want to give anything away with this review because there is so much in this book that my review wouldn’t even do it justice. Just know that this book made me laugh, cry, and fall in love. The secondary characters are amazing and I can’t wait to see whose story is next. This is for sure a re-read in my future. Born and raised in Baltimore, I grew up dancing and swimming. I taught dance—ballet, tap, jazz, hip hop & modern—for ten years before I had my kids. Now I’m a stay-at-home mom who reads, writes and does PTA everything—as long as I have my coffee. Two other tattooed moms and I run the whole damn PTA, and if I may say so myself, we rock it… even if I want to rip my hair out more than half the time. 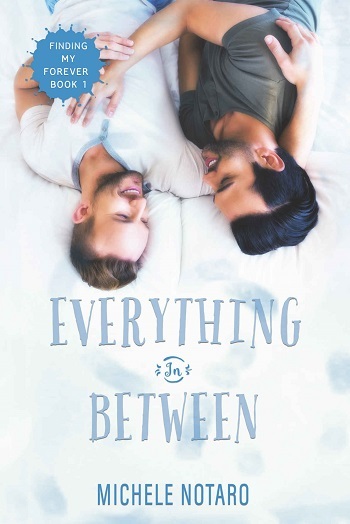 Angie reviewed her personal copy of Everything In Between (Finding My Forever #1) by Michele Notaro for this post.